Once you’ve been in the advocacy and transportation business for so many years, it is hard not to have an opinion. So this is my home for now and thank you for reading. Because of my involvement in various committees and groups, it is important to note that the opinion expressed here does not necessarily represent the opinion of the groups and committees that I belonged to, as well as the Transit Unlimited Wiki. If VTA actually considered, then we might have a rail connection for quite sometime now rather than still waiting for BART and VTA to settle their issues. I used to have a separate web site for these ideas, but the advent of social media platforms and content management systems, along with changes with my hosting provider, resulted in these contents no longer appearing online. higher than typical light rail trains. Right of Way: Purchase railroad right of way from Union Pacific. constructed or upgraded to accomodate 6-car trains. timed to meet BART trains. for seamless connection to BART and other systems. of certain portions of the surface and underground LRT right of way. separate surface tracks for VTA light rail. only higher-income commuters from East Bay will enjoy. capacity to accomodate the additional riders. for future extension of LRT system on corridors such as Stevens Creek. requires a train to have at least three cars. peak period, covering many employment centers in the Golden Triangle area. must be constructed at Shinn. station is not close to any existing railroad right of way. is not close to any major origin or destination. 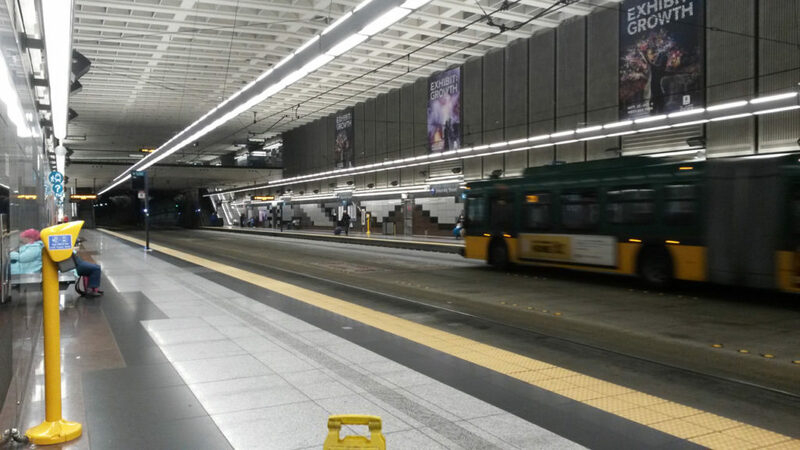 Today is the last day where buses would operate in the Downtown Transit Tunnel in Seattle. Starting tomorrow the tunnel would be rail only with Sound Transit Link service to SeaTac and UW, but will eventually expand as multiple extension projects complete to Northgate/Lynnwood, Bellevue/Redmond, and Federal Way. I had a chance to visit that tunnel in 2015, about a few months before the Link expanded to UW. I found this unique sharing arrangement between buses and transit to be very cool. Most of us grow up with very distinct experiences between riding the bus and rail. With buses, you board the bus on the street, you pay as you board, and you ride along with car traffic stopping at every red light. With rail, we go to a dedicated station, buy tickets and go through fare gates, walk up or down to reach the platform and ride the train away from traffic. With this system, you may board a bus normally on the street on one end, but you would arrive in a downtown subway traffic free as if you’re riding on a subway train, but without the hassle of transferring systems like you would almost anywhere else, even the most transit oriented cities around the world. Many transit systems have rail vehicles operate like buses on the surface (streetcar/tram), but running buses underground like a subway, especially where the tunnel is shared with rail, is truly one of a kind. Some suggested that the tunnel should be built for rail to begin with, but I think that almost 30 years of bus use in the tunnel, with nearly 20 years of exclusive bus use, proved its worthiness as a bus facility. Under this arrangement, Seattle was able to build its rail system in an incremental basis, to build one of the most expensive and essential infrastructure early on, and to put it to daily use without having the rest of the rail system done. That 30 years of bus use meant two generations of bus fleets. The first generation was a fleet of diesel dual mode vehicles: operate with diesel engine on the surface and off trolley wires underground. The second generation is a fleet of hybrid buses. The trolley wires for the bus had to be removed because it would conflict with overhead lines for rail. Newer hybrid technology for the 2nd generation of bus fleet reduced bus emissions so they could operate safely underground. Given that many transit systems are pursuing bus rapid transit (to operate buses more like rail with dedicated right of way and/or stations), not operating buses in tunnel is a set back to some degree. To accommodate the extra bus traffic on downtown streets, the city recently designated bus lanes on certain streets and the transit agency will be instituting all door boarding. However those on street traffic treatments are far from unique with varying degrees of success. Also picking up buses curbside on downtown streets will not be anything close to boarding buses inside a subway station. I wished that Seattle somehow finds a way to continue tunnel bus operations, but we all know that it will come to an end as the region commits to more rail expansions. I am troubled with the plan to reduce VTA’s transit operating budget. For a long time now VTA has not been playing in a relevant role in reducing traffic or provide a transportation alternative in a region that is suffering from housing shortage and increasing traffic congestion. For many years, Silicon Valley business and political leaders have been pushing for sales taxes to increase transportation funding, but at nearly all instances VTA proposed and enacted service reduction within a few years after a tax is approved. Meanwhile, some of the same local politicians come out and declare that their city is not able to accommodate more housing because the city has no transit. It appears that while taxpayers are generous, there is no serious effort in improving mass transit, and subsequently be used as an excuse for inaction. Basically for the past 20 years VTA is a BART construction agency with running buses and light rail as a side business. I do not share the same faith as many of the VTA board members have that extending a unique wide gauge subway system (and taking money away from other transit priorities) will somehow cause a transit revolution in the Silicon Valley. It is ironic that the San Jose mayor (also sits on the VTA board) is inviting the Boring Company to come up with a low cost solution for a fixed guideway link between the Diridon Station and San Jose Airport, because VTA does not have enough funding to make the connection on its own, but insists on VTA to fund a multi-billion large bore tunnel for BART. By observing trend across regions, transit usage and transit oriented developments grow when basic transit services increase, such as in Seattle, as well as pursuing lower cost solutions for rail. 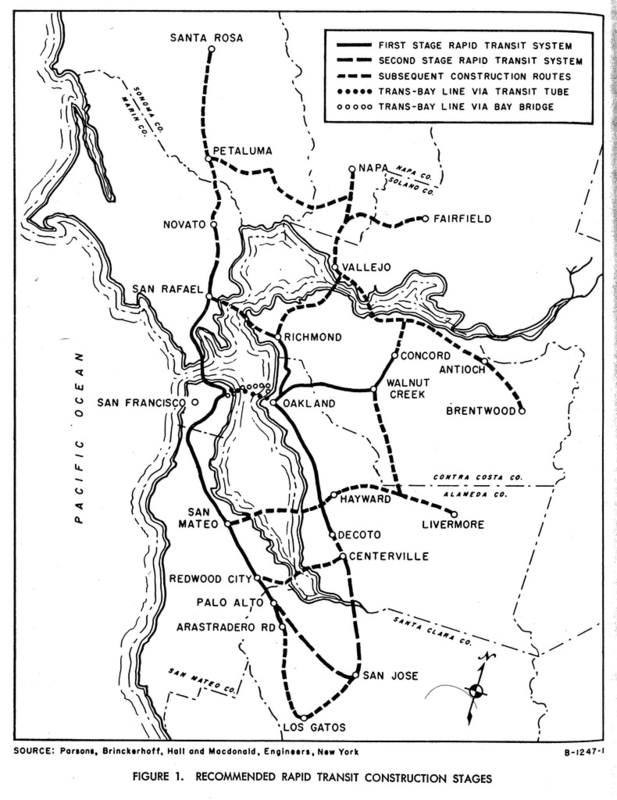 The eBART line in Antioch demonstrated lower cost and superiority of standard gauge rail technology while preserving full connectivity with the old BART system (good enough to appear as a single continuous line on the BART system map). If the valley leaders had listened, we would’ve had a rail around the bay many years already. I am not in favor of the 90-10 service allocation. Many “service increases” in the plan would add runs at the margins (like early morning or later in the evening), or slightly boosting all day frequency. I do not believe that productivity of re-allocated services would necessarily be improved. Today, VTA can tell the communities that they’re removing unproductive routes from transit starved areas as service reallocation. What would stop VTA in the future to reduce service that were initially reallocated because productivity hasn’t improved? This appears to be a bait and switch in an attempt to diffuse resistance to general service cuts. It would be a easier sell to reduce service from 7 minutes to 10 minutes on line 500 a few years later than to eliminate an entire route in the suburbs as a strategy to cut transit funding. On that basis, I am not in favor of eliminating line 22 overnight service and the Almaden light rail line. I am also not in favor of cutting the Blue Line to Baypointe. The Orange Line should only operate during the peak. At other times, the Blue and Green lines should operate as it is presently. 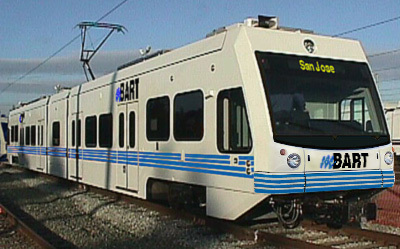 I believe that there would be more interest for a rail to rail connection between BART and Downtown San Jose via a single light rail ride on the Blue Line than to the west via the Orange Line. I would suggest that VTA should drop the express fare entirely. 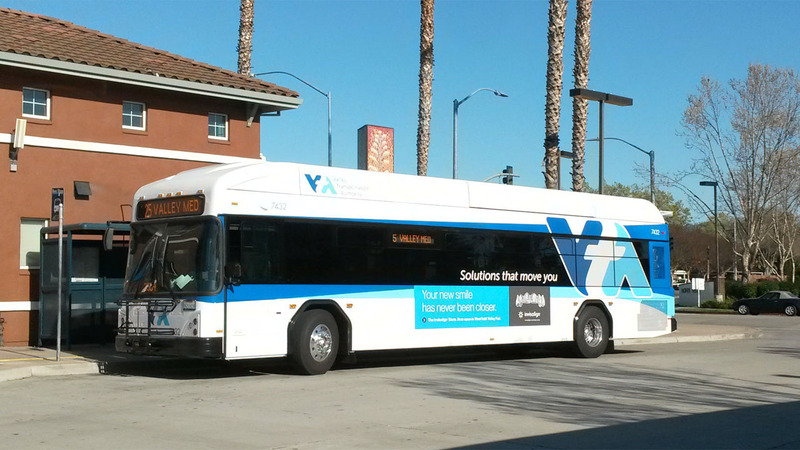 VTA staff indicated that the express routes are not productive because of the lack of seat turnovers, and that the express routes also experience high cost per rider and low farebox recovery compared to local routes. By dropping the express fare category, express routes would be able to accept local passengers and provide them with additional options. For example, riders from Morgan Hill to Gilroy in the afternoon can board line 168 buses in addition to line 68 buses operating on the same street. Many agencies implement higher fares as a zone surcharge, but VTA’s surcharge is a speed premium than a distance/zone premium. After BART is opened, all of the express routes would be entirely within Santa Clara County, and would be covered by VTA’s local service (but would take longer, or may be a transfer or two). In light of the social-economic inequality and long distance commutes endured by many of the low income residents, along with the complexity of implementing a multi-tiered fare scheme, it would be a wise policy of eliminating the express fares entirely. I believe it would have little financial impact on VTA but can significantly improve productivity and improve transit experience. Low income riders can board whichever bus that will get them faster, rather than boarding the local bus for a long trip because they cannot afford the speed premium. Express routes could be redesigned to better connect with local service or even substitute some of the local service to enhance coverage. Rather than cutting the transit operating budget, VTA should look elsewhere to address its financial issues, and particularly look into its project priorities. For many years we heard a lot of excuses why transit hasn’t work or wouldn’t work in the valley but nothing much about improving it or make any serious commitment to it. From time to time you see VTA taking on new initiatives (micro-transit or BRT) but often VTA walks away and let them die when the agency encounter slight difficulties. This “BART-above-all-else” and “nothing’s-worth-doing” attitudes are extremely discouraging to many transit, environmental, and sustainable development advocates like me who could and should be VTA allies, not critics. We're going to make high-speed rail a reality for CA. We have the capacity to complete the rail between Merced and Bakersfield. We will continue our regional projects north and south. Finish Phase 1 enviro work. Connect the Central Valley to other parts of the state. Some say that he’s stopping high speed rail, but clearly he doesn’t intend to stop whatever’s being built on the ground. Is he somehow against high speed rail altogether? I don’t think so. Some people think that Newsom should just continue the project as originally planned, but considering the difficulties over the last decade a “timeout” is long overdue. What is clear is that according to the current high speed rail business plan, it would require far more funding and would take much longer to complete. It would require a significant commitment, not only from the current generations of politicians, but from the future generations a decade or two to come. It is just a matter of time that someone hits a pause button. Without new funding sources, the state would have to divert funds from existing transportation projects. But more than that, the high speed rail project has several barriers due to some longstanding unresolved issues. Prop 1A, the ballot measure that enabled the high speed rail project, is unusual that it contained several “performance measures” that specified the travel time. While on one hand it appears like a marketing language in a car brochure about the vehicle’s capability, it also placed constraints because the only way to amend a language in a ballot measure is with another ballot measure, or unless a judge agrees that what the authority is doing still somehow complies with the ballot measure. As a result, the project suffered a series of lawsuits. Entities that disagree with the authority can take the issue to the court and drag the lawsuit for years to come. Voters were told that the high-speed trains would hit 220 mph, get from Los Angeles to San Francisco in two hours and 40 minutes, operate without subsidies and obtain funding and environmental clearances for entire operating segments before construction. It was the state legislature that drafted the Prop 1A language and the High Speed Rail Authority that endorsed it. Why would the state and the agency commit to a requirement that they cannot fulfill? The reason is that there are different visions among the legislators and HSRA board members regarding high speed rail. Some people, like Quentin Kopp, who was the chairman of the HSR Authority during the time when Prop 1A was drafted and placed on the ballot, believe that high speed rail should be a dedicated, segregated system similar to Japan. On the other hand, other high speed rail supporters believe in a European version of the trains where high speed trains can share tracks with local trains. That dispute wasn’t settled even well after Prop 1A was approved. In 2009, the authority released a 4 track segregated plan for the Peninsula Corridor. Kopp believed in a 4 track segregated plan as it would clearly meet the performance goals as required by the Prop 1A language, but many local cities, who have endorsed Prop 1A when it appeared on the ballot, thought high speed rail would be blended with Caltrain. They wouldn’t have supported the ballot measure if they had known that a 4 track system was planned. The 2009 plan met with huge resistance from the communities. A blended system compromise was reached and approved by the state legislature, but it was challenged in court from those who do not want to see any infrastructure improvement on the rail corridor. The alignment between the Bay Area and the Central Valley has also been a long ongoing struggle, despite the fact that Pacheco has been a designated high speed rail corridor for years even before Prop 1A was drafted. Shorter travel time from San Francisco to LA than Pacheco. It is along an established rail corridor over the Dumbarton Rail Bridge and Altamont Pass. San Jose would be served by a line from Fremont to San Jose, while it would take longer to LA but would be shorter to Sacramento if line to Sacramento were built. Able to serve more of the Bay Area commute-shed such as Tracy and Modesto and get the line closer to Sacramento. Would operate along the entire length of the Caltrain corridor. Every train to/from SF would go through San Jose, rather than be served by a branch. Get the line closer to the Monterey Bay Area. 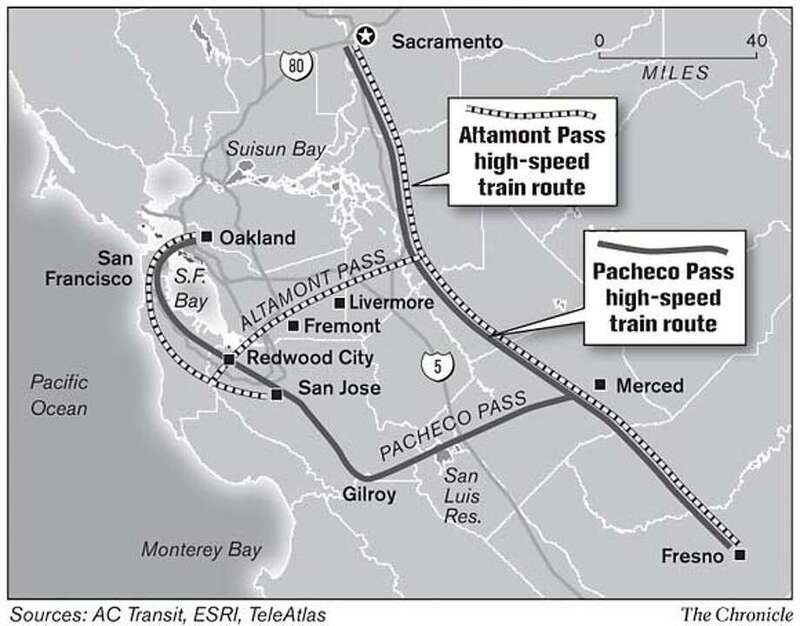 Led by Rod Diridon, a long time High Speed Rail Authority board member, the San Jose interests were able to convince the agency to select the Pacheco alignment and drop the Altamont Pass from further consideration. They like the idea of having Diridon Station be a hub along the main line and not a terminal of a branch line. Those who support the BART extension from Fremont to San Jose would have one less potential competition. Although the board approved what the San Jose leaders had wanted, the project still faced difficulties in San Jose especially in the alignment just south of the Diridon Station. The performance criteria set by Prop 1A didn’t help as the current Diridon Station isn’t big enough or straight enough. Much more expensive and disruptive solutions were proposed including an underground station crossing an underground BART alignment. The HSR Authority, still recognizing that the Altamont is still a key commute corridor, funded a separate study to improve the Altamont Pass to become a feeder corridor to the High Speed Rail system, but the project has gone nowhere after the initial study. Although the concept has support in the San Joaquin County where it is a part of the Bay Area commute shed, it has little support in the Tri-Valley and the Silicon Valley, where they focus on extending BART. Although not as controversial as Altamont vs. Pacheco, the selection of the Tehachapi pass is not without detractors. The Authority chose the Tehachapi pass because of the political support from the desert communities (a commute shed for the Los Angeles area). Also by routing through the desert, it could be a link for rail line to Las Vegas. But none the less the Tehachapi pass appears to be a detour compare to I-5, and especially in light of the performance criteria set by Prop 1A. Also the Tehachapi pass requires the line to go through Bakersfield. Although High Speed Rail proposed a station in Downtown Bakersfield as policy recommended, its operational demands require a much bigger footprint that is incompatible with a quiet, conservative city. The rail authority had to reconfigure its plan to avoid downtown. For those who want to walk away: Abandoning high speed rail means we will have wasted billions of dollars with nothing but broken promises and lawsuits to show for it. I'm not interested in sending $3.5B in federal funding–exclusively allocated for HSR–back to the White House. Rail supporters and many HSR critics agree that whatever is being built must be finished. But is the end product be a train from nowhere to nowhere? With proper planning I think it is possible to have an end product where trains can serve the Bay Area and/or Sacramento that is faster than Brightline, a “high speed rail” line in Florida, or Acela in the East Coast. It may not be Japan, but it could be more like Europe if not America. The state has ordered locomotives and railcars for its Amtrak fleet that are the same as those used by the Brightline in Florida, all produced by Siemens in Sacramento. They will have the capability to operate at 125 mph. Currently the Amtrak San Joaquin trains go to Sacramento and Oakland. These trains can operate at high speed on HSR tracks and at conventional speed outside of HSR tracks, but still provide direct service. There are already projects to improve rail corridors in the upper San Joaquin Valley area to extend ACE and improve Amtrak service, which include ACE extension as far as Merced, where the current phase for high speed rail construction is supposed to end. Also in a rare move, Union Pacific made one of its rail corridor between Stockton and Sacramento available to passenger rail. Basically trains from Bakersfield, once leaving the high speed tracks in Merced, can go three ways: Sacramento, Oakland, and San Jose via the Altamont Pass at conventional speed. In previous business plans, they talked about some kind of coordinated service upon the completion of the 1st HSR segment in the Central Valley. However the concept is vague and has gone nowhere beyond showing up on the documents. This is time to address it. Construction of the initial operating section of High-Speed Rail is planned to be completed in 2018. This initial section of tracks will be put to use immediately upon completion and deliver early benefits by allowing the existing San Joaquin route to operate on the new tracks until the initiation of full High-Speed Rail service. With creation of the “Northern California Unified Service,” the San Joaquin route, ACE, and Capitol Corridor trains will be enhanced and operated in a more integrated manner, creating an improved network reaching from Bakersfield to the San Francisco Bay Area and Sacramento. Once everything is done, it would up to future voters and future politicians to decide where to build and where to improve. The mistakes written into Prop 1A would no longer hamper them. I think Newsom understands that High Speed Rail should be done differently, but at this current political environment it is hard to continue commitment given the constraints set by Prop 1A. If the idea is to provide new funding or make big changes to the program, he would have to get voter approval, which wouldn’t be feasible until there’s something to show, some train running somewhere. So I agree that the priority is to get the Central Valley segment done. Newsom’s announcement may seem to be a mixed message whether you’re for or against high speed rail, but for me his intention is crystal clear. The flaw of Prop 1A is that it requires the state to be perfect in its execution, but it is being weaponized by those who don’t want us transitioning to a green economy, and we cannot allow them to have that. Elon Musk’s unveiling of a tunnel is causing quite a stir in the transit advocacy community. Musk promised a high speed network of cars moving in a tunnel but only demonstrated a normal car moving on a rough surface inside a tunnel at a much lower speed. While we can fairly question the wisdom of putting cars in a tunnel instead of trains, as well as the technical feasibility of a vehicle traveling more than 100 mph, there are things that transit advocates and planners can take away from. Musk was able to build a tunnel at a very low cost. Part of the reason for the low cost, in comparison to transit projects, is that the tunnel is just plan tunnel, without stations, tracks, wayside power, signaling systems, and maintenance facility. Also with rail, you will need a longer line (beyond the gap corridor) to make the service usable and allow for connections. Can we deliver transit with tunnels without the high cost associated with traditional subway constructions? I think it is possible. I think the concept of bus subways should be visited. Bus subways are only needed in gap corridors and otherwise buses use regular streets outside the gap. We already have buses running on electricity and with physical guides. The only thing that prevented tunnel buses running in high speed is a vehicle control/signaling system that has long been available to rail, but autonomous vehicle technology may address that. Guided buses in Adelaide, Australia. Basically, build a pair of tunnels for guided buses strictly in the gap corridor where tunnels are necessary. Forget the stations and the rest. Run buses on streets from either end of the tunnels. Compared to a single rail line, a bus network would allow for more point to point service with fewer transfers. This allows for an incremental transportation improvement with a limited infrastructure in place, and allows the cities to build-as-we-go. The reality is that physical infrastructure is expensive. The bigger and more complex the system is, the more expensive it is to build and deliver. A rail subway system has many physical infrastructure: tunnels, stations, tracks, wayside power, signal system, maintenance facility. Because of the large scope, both in geographical and infrastructure, it can easily take a generation to build a high speed rail system linking northern and southern California. A guided bus system can go with plain tunnels with a simpler concrete pavement. Power can be delivered by battery. Autonomous vehicle technology can replace a physical track signal system. Buses would use surface bus stops and continue service on surface streets beyond the tunnels. Such system can be useful to address the gap corridors, like the transbay corridor and the Sepulveda Pass, where additional transit infrastructure is desired and alternatives are limited. In both examples, tunnels can be built only for these gaps. Bus tunnels can also address shorter gaps, such as between the Dumbarton Bridge approach and Downtown Palo Alto/Stanford University. For decades, the bridge and Downtown Palo Alto are linked by surface streets. While the corridor is only about 3 miles long, it can take 45 minutes to travel during peak times due to street congestion. Freeways and surface street widening are not viable because of NIMBY issues south of the 101 freeway and social justice issues north of the freeway. Residents on both sides of the freeway want less and slower traffic. While there’s a rail corridor, it doesn’t directly connect to Palo Alto. A connection to Palo Alto via the Caltrain tracks would put more trains on the over-burdened Caltrain corridor. A stationless tunnel can connect the gap and make transit significantly more competitive and would have minimal impacts to the ground above, whether it is the low income North Menlo Park/East Palo Alto or the uber-wealthy Palo Alto. Buses can begin route from various points in the East Bay and end route in other locations on the Stanford campus. Buses can pick up from the train station and drop off at the Facebook campus. The key to make this possible is a significant reduction in tunnel construction cost. We would be running more buses anyway, but a tunnel would reduce operating times and improve ridership. These days, many major transportation structure like tunnels and bridges have bicycle and pedestrian paths built in to provide access to active transportation modes, whether it is for transportation or recreational purposes. But in previous decades, planners didn’t include them because they weren’t considered to be serious transportation. While it is relatively inexpensive to include bike/ped path to new construction, it is rather cost prohibitive to add a path alongside an existing structure. It is estimated to cost up to $300 million to put a path on the western span of the Bay Bridge. Either as an alternative to building a path, or as an interim measure until the path is built, could there be a dedicated bike shuttle service to bridge the gap? As the case of the Bay Bridge, Caltrans already operates a peak hour van with a bike trailer that carries 14 bicycles and riders. It runs 4 peak trips so the peak capacity is total of 56 bikes, far less than what Caltrain could carry on a single train on the Peninsula. In the 1960s, Dartford Tunnel was opened east of London. It didn’t provide a bike path but there was a desire to provide bicycle access through the tunnel with a shuttle. The transportation authority procured special buses and platforms to shuttle bikes for free. The design of the buses was unique and bizarre. The lower deck comprised two cycle racks capable of taking 23 bicycles, accessible from either side of the bus. At the rear of the bus was a large space to accommodate tricycles, tandems, perambulators and sidecars. The upper deck of the bus provided seating for 33 passengers and was accessible via a series of steps built into the side of the bus. The cost of the whole fleet was a little over £12,000, and they were heralded as the first of this type of bus in the world. Because the level of the bike rack and steps to the door are well above the ground, platforms (loading docks) were built to provide level access. Despite the incredible level of investment provided, usage remained low (both sides of the crossings are suburbs). The buses were eventually replaced by SUVs equipped with bike racks. Today cyclists can request for a pick up at the entrance and service is provided on demand. Interestingly, when they added a second parallel tube and a parallel bridge to increase corridor capacity in the 80s and 90s, neither structures have bike paths. If Caltrans had provided this level of investment and capacity for the Bay Bridge, I think it would be very well utilized. It would also attract cyclists who wouldn’t have used the bike path (if built) because of the distance and grade involved. Caltrans could consider using double deck buses with interior racks on the lower level, stacked the same way as on Caltrain. They could consider very tall single level coaches with bike racks located where the baggage area normally is supposed to be. They could use a shuttle size bus and high capacity bike trailers. Some can take up to 24 bikes. It seems like that we should consider these ideas seriously. BART’s only standard gauge line between Pittsburg and Antioch is set to open sometime in May of this year. Given my long time advocacy (2 decades!) for standard rail over BART this is the only BART extension that I look forward to. For many decades, there’s been a struggle between expanding BART versus expanding a standard gauge rail line like Caltrain in the Bay Area. BART’s hardware is unique and designed to work as an urban metro system (and also carries a high price tag). Caltrain’s hardware is off-the-shelf and designed for the suburban/regional environment. The expansions in question, whether it is to SFO or San Jose, is largely suburban and regional. Some think that BART’s wide gauge custom design ought to be the only standard for regional transit in the Bay Area, as envisioned in the 1950s. They’ve been pushing BART around the Bay and BART replacing Caltrain. They think that other rail technologies somehow wouldn’t be capable to do what BART does. They would tell you that if you want trains every 15 minutes all day on the Peninsula, replace Caltrain by extending BART. On the other hand many regions in the United States and beyond have trains that have different physical characteristics but operated by the same agency and even under the same brand. They often feature integrated fares and coordinated scheduling. In Los Angeles and Boston, lines that have color designations include urban metro lines, light rail lines, and bus routes (with dedicated bus ways). Systems in Seattle, Denver, and Salt Lake City operate the commuter rail and light rail. In case of Denver, the commuter rail and light rail are both electric, operate at high frequency, and share the same regional zone fare structure. So basically the branding of the train doesn’t require that they all have the same physical characteristics. If a Caltrain or a SMART train has BART logos and operate as frequent as BART, then they’re BART. 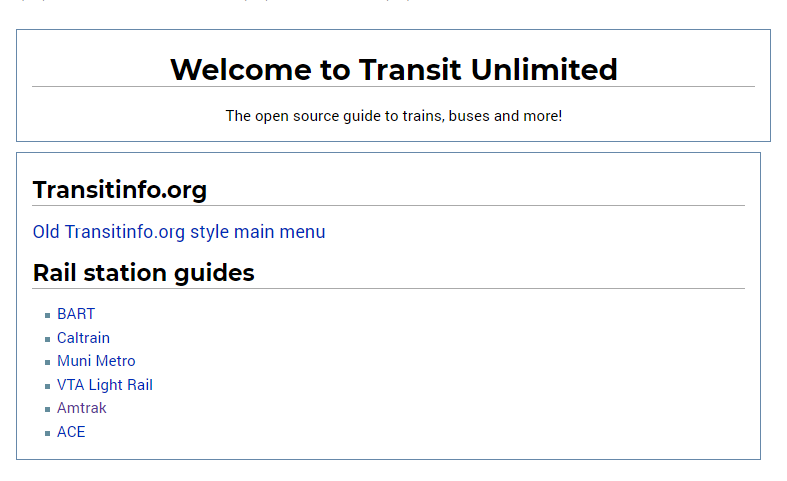 About 10 years ago, Transit Unlimited Wiki was born. While the Bay Area has many transportation alternatives, it is often hard to figure out what options there are and how to use them. It can be especially confusing for new and infrequent riders and visitors on vacation or business. The goal of this project is to fill in the gaps left by the official transit web sites and online transit trip planners with the information and knowledge experienced riders have picked up along the way. After 10 years, things have changed quite a bit. Trip planning and mapping technologies have advanced. Transit schedules now have a industry standard format. More transit agencies offer real time information. We support real time departure information on the wiki for agencies that offer open API access. We expanded beyond the Bay Area. In 2009 we expand coverage in Sacramento and Southern California. We are covering all the way to Chicago. Mobile devices are common today. We have a mobile version of the wiki. Transit agencies are using social media for service alerts and announcements. We integrate and embed these information whenever available to provide a one-stop shop. Complementary services like bike sharing is available in more locations. Agencies and cities are testing app-enabled ride services. Cities are building rail-like bus rapid transit lines with dedicated facilities. Saw significant reduction on transit due to the Great Recession, and seeing recovery in service as the economy improves. We still have a lot more work to do. Eventually I want to see the wiki to cover coast to coast, from the Mexican border to the Canadian border. Besides the major cities, there’s transit in the rural areas (intercity and dial-a-ride) throughout the country. I believe that this is the only wiki dedicated to transit service information available today. There were attempts for wikis to provide transit information. There are also wikis today that cover transit agencies in different aspects (professional planners, fleet details). I think part of this wiki’s success is the use of the Semantic MediaWiki extension, which allows the information to be entered once on a page and then queried many times in other pages. That’s how we could provide the same level of detail for transit service on some strip mall in a city, and provide interactive maps for a bus route, a region, a city, or a county. Our strength is still our agency-independence format and coverage, as well as a human touch beyond machine readable information formats like GTFS. One of the most popular wikis for transit information is Wikipedia. The help of enthusiastic editors can allow transit information to be available in high details. However because of Wikipedia’s broad and general mission, as well as standard for notability and 3rd party reference, such information and level of detail may not always be appreciated. I believe that Transit.wiki and Wikipedia have separate roles even covering the same transit agency, route, or infrastructure. Transit.wiki focuses on being a user guide and directory, and Wikipedia focuses on background, history, and controversies. Recently there’s a dangerous trend where car drivers intrude onto the rail right of way. In many cases, the car simply got stuck on the track and trains were held while waiting for the tow truck to remove the vehicle. In other cases, the train hit the unoccupied vehicle. Either way, trains were delayed and rides got frustrated. Below are the known incidents that involved vehicles entering the rail right of way in the past 8 years. This is a partial list since there are other non-collision intrusion events that are not reported in the news or through Twitter. Most of them do not result in injuries or deaths because the vehicle occupants were able to escape before the collision. Most of them occurred during night or early morning hours when visibility is limited, which is especially problematic during winter months as daylights are much shorter than during summer months. They occur at crossings immediately adjacent to street intersections, where distance is at most a few cars’ length. Many of them turned right and entered the right of way when they tried to follow the GPS direction (that they should turn right after crossing the tracks) and were otherwise not familiar with the area (being from out of town). Most frequently occurred at Broadway in Burlingame, and at Meadow and Charleston in south Palo Alto. 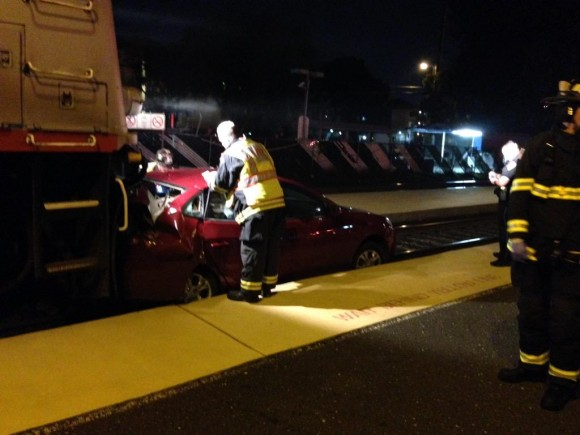 It is imperative for Caltrain to cut down the number of these collisions, as they are all preventable. These events not only cause serious service disruptions to train riders and others on the roads, they may result in fire (which occurred in the two February 2018 incidents). East Bay Coast Line Passenger Rail?